My baby girl is growing like a weed! At three months, she now fits into six month clothing. Unfortunately, she has very little six month clothing, and most of it is summery--as I realized when a cold front came through last weekend and she had, like, one long-sleeved outfit. I had already been planning on making some outfits for her; the weather just moved that project to the top of my priority list. My model was not very happy with me, haha. This was the closest thing to a smile I could get out of her at the time. I know I will end up buying some clothes for her, especially if I can find some good clearance sales, but baby clothes are expensive! Especially when they only fit for, oh, I don't know, a month or two? So what does this crafty momma decide to do? Make the baby clothes, of course. Now, buying fabric isn't always cheaper than buying clothes ready-made, so I decided to raid my closet for things I don't wear anymore that can be turned into clothes for my daughter. How's that for thrifty? This post is going to be the first in a series on DIY baby clothes made from things already in your closet. Aside from a few minor costs like buttons or elastic, these clothes will be completely free, while also helping you clean out your old clothes! Win-win! (Note--you could make these without the snap tape and just sew the crotch seam, you would just have to completely remove the overalls with every diaper change). 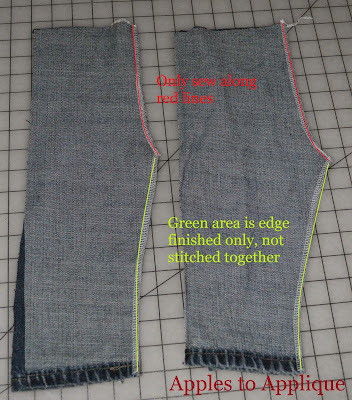 A note about cutting your pattern: if you are using a pair of pants that fit your child well in the waist, or are snug like elastic-waist pants, you will probably want to add some extra seam allowance to the side seams when you cut out your pattern. Just make sure to add this extra allowance on the sides of both front and back leg pieces and the front and back bodice pieces. First, cut open your jean legs and lay them flat. Fold your pattern pair of pants in half with the back on the outside. Lay this on the jeans. Cut around your pattern, leaving about 1/2" all the way around for seam allowance. 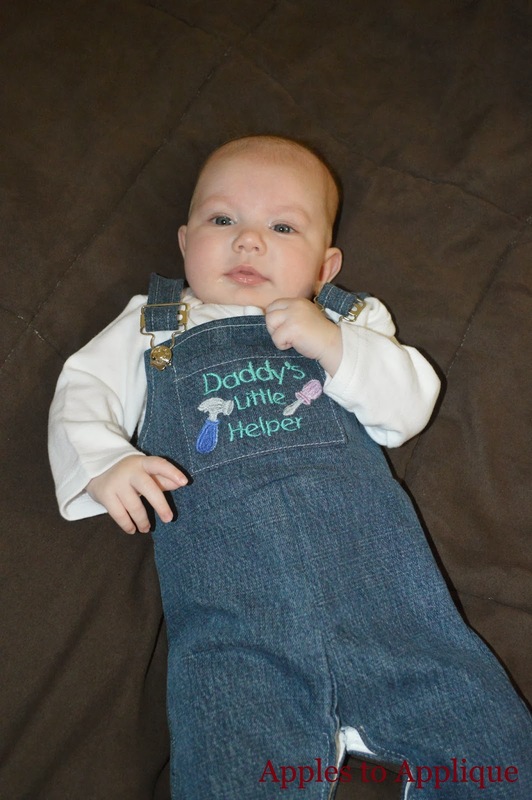 I wanted to use the original hem for my overalls, but I also wanted to make my overalls longer than my pattern (my baby girl is in the 90th percentile for height--crazy!). If you are happy with the length of your pattern pants and want to keep the original jeans hem, line up the bottom of your pattern pant leg with the bottom of the jeans. If you want to put a hem in yourself, leave an inch or so allowance at the bottom. Using your newly cut piece as a pattern, cut out a second back leg piece. Make sure to cut a mirror image! In other words, lay your previously cut piece upside down as you cut out the second piece. You now have your two back leg pieces. To cut out the front leg pieces, fold your pattern pants in half with the front on the outside and place it on top of your jeans. Cut out your front pant leg, again leaving your seam allowance. If you are adding extra length to the hem, like I did, make sure you add the same amount so the front and back will match up. Cut a mirror image of the piece you just cut to get your second front pant leg. Okay, the leg portion of your overalls is ready! Measuring for the top part of the overalls was a little more complicated, so stay with me and I will do my best to outline my process. Measure the back width of your pattern pants. Mine were about 8 inches across; adding 1/2" on each side for my seam allowance gave me a measurement of 9 inches. Now, lay out your onesie/shirt and measure the back from the shoulder down to the approximate waistline. Mine was about 7 inches. This measurement doesn't need to be exact, because you will be trimming it down in a minute; the width measurement is the only one that needs to be accurate at this point. This height measurement just gives you a starting point. Cut a rectangle of your fabric using these two measurements. Now you have the width for the top part, but obviously we don't want the back to come up in a perfect square. We need to shape it into a triangley piece to connect with the straps. Laying out your onesie upside-down again, line up the bottom of your rectangle about 1/2" below the waistline of your onesie; this will allow the seam to sit at the waistline. I curved my tape measure around the approximate line I wanted the overalls to follow, from the center to the side seam. I wanted the side seam to come up to about half an inch below the armhole seam, and the top part of the back to stop about 2-3" from the onesie neckline. Putting a finger or a pin at the highest center point on the curve you made, measure from there to the top of the rectangle. My measurement was about 3 inches. Cut this excess off of your rectangle. You should be left with a longer, skinnier rectangle. This is now the height and width of your bodice back. Fold the rectangle in half and lay it on top of the onesie, matching the fold up to the center of the onesie. Trim off the corner in a curved shape, as shown. You now have your bodice back! You're going to repeat a similar process to create the front bib piece. Measure the width of the front of your pattern pants. Mine was the same; it may be the same for most infant/toddler clothing, but it doesn't hurt to measure and double-check. Cut another fabric square. Lay your onesie, right side up this time, on top of your square. Put the bottom of the square about 1/2" below the waist to allow for seam allowance. Measure the front of your onesie from the top of the shoulder seam to the place where you want the front bib to reach. Cut the excess off the top of the rectangle, just as you did for the back. Fold the rectangle in half and lay it on top of the onesie, matching the fold to the center of the onesie. Lay your bodice back piece on top of the rectangle. You will be using this as a guide to make sure your front and back side seams will match up. Starting at the side seam to ensure it will be the same length as the back side seam, cut the corner off of the bodice front to create the bib shape. You now have your bodice front! To measure for the straps, lay open the bodice back piece on top of your onesie. Measure an approximate distance from the back, over the shoulder, and to the front. Whatever your measurement is, add a few inches to allow room for the strap to go through the buckle, and to let it out as your child grows. Measure the curve on the bodice back to determine how wide you want the strap to be at that point. Cut a rectangle that width by the length you measured earlier, plus your few additional inches. Starting at one end, curve your straps to match the curve of the bodice back. Keeping that end as your wide end, narrow the rest of the strap. The buckles you chose will determine the finished width your strap should have. My buckles said they were for a 1" wide strap. Remember to add your seam allowance; I only added an extra 1/4" on each side of the straps. Cut a small square to make a pocket. I started with a 5" x 5" square. If you want to embroider on the pocket, do it now. I merged a few designs I purchased from Embroidery Library. Serge or edge finish around the edges of your pocket. Fold down about 1/2" on the top edge of the pocket and stitch. Press under 1/4" on remaining three edges. Pin pocket to front overall bib. Stitch around three edges of the pocket. Serge inner leg edges on all 4 leg pieces. Do not sew anything together yet, this is where you will sew the snap tape in a little bit. This step is just to keep the edges from raveling. 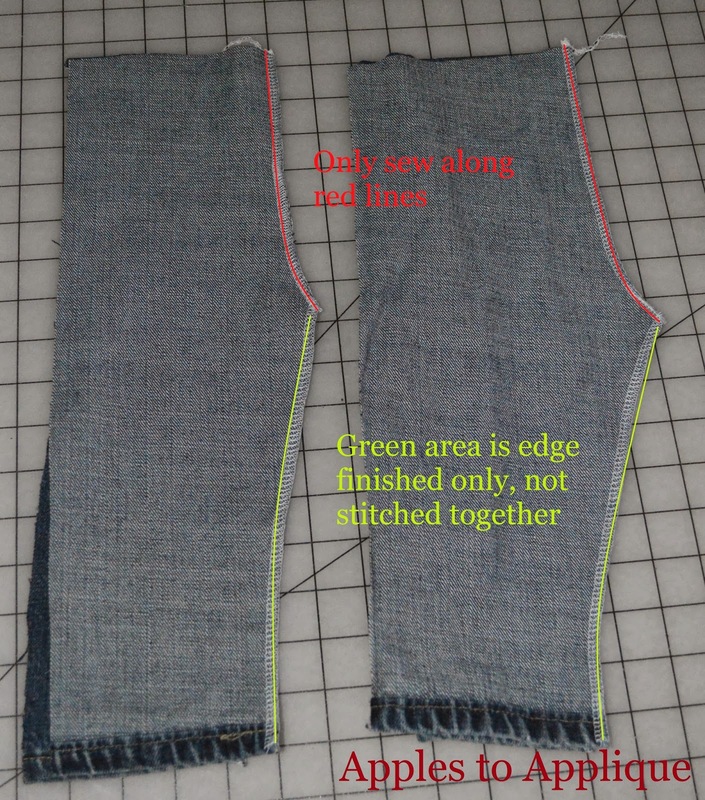 On hem edge, tuck in serger tails using this method. With right sides together, pin front leg pieces together at crotch seam. Stitch crotch seam. Repeat with back leg pieces. Note: It's hard to tell in this picture, but only the curved crotch part is actually sewn together. The inner leg seams have been edge finished only. Sew front legs to back legs at side seams. Again, tuck in the serger tails at the hem. Serge or edge finish top edges of bodice front and back pieces. Serge or edge finish strap edges. Press under 1/4" on long strap edges and narrow strap end. Stitch. Pin straps to bodice back. Stitch. Sew bodice front and back together at side seams. Press down 1/4" on top and underarm edges of bodice front and back. Stitch. Be careful not to stitch your straps inside as you do this. Here's how the back should look from the outside at this point. See how cute it's starting to look! Matching side seams, sew bodice to pant legs. Turn your overalls right-side out. Getting closer! Sew snap tape to inner leg seams, being careful to line up the snaps so that your hem will come out even. I like mine with a little cuff at the bottom, plus I made them long to allow room for growth. Add overall buttons following package directions, and feed the straps through the buckles. Your overalls are finished! Pat yourself on the back for following this long post, and then go put those overalls on your little cutie!